Moles can be seen on the various party of the body, face. Usually these are harmless and can appear flat or raised. Just as other surgical procedures mole removal also takes place under local anaesthetic, which means there is no fear of pain. Patient’s comfort is priority during the procedure so just relax. 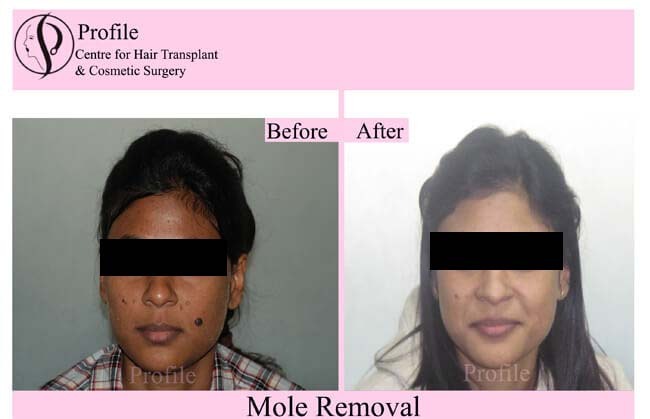 The type of procedure to be performed for removing the moles is based on the type and placement of mole. Most of the cosmetic surgeons care to use scalpel to remove mole and then close the wound with stitches. includes instant freezing the mole with liquid nitrogen and removing it precisely via high-energy laser. In some of the cases, the operation might leave a scar which tends to fade away within one year of operation. The size of scar also depends on the size of mole removed, also type of surgery performed plays a noticeable role in scar formation. If the scar is big, our surgeons also suggest the patient to go through scar removal surgery just to remove any remaining flaws. To know more about the factors such as cost, type and complications please consult one of our cosmetic surgeons and they will determine which kind of procedure will suit best as per your aesthetic goals and medical condition. Profile Cosmetic Surgery Centre is not just an usual Cosmetic Surgery Centre where surgeries are performed in actual fact, our centre is a place where passion meets profession. We are dedicated to the client satisfaction, with years of working and modern technology, we are capable of delivering more than just results. Inexpensive post care, less chances of complications, friendly environment, comforting procedures and specific tailored procedures for specific patient makes us prominent among best of cosmetic surgery centres.